The Astana Arena was full of cheering soccer enthusiasts, cheering for the Astana Football Club and using their clapping booklets, conveniently left on their seats, to make as much noise as possible. You could hear them from the parking lots. I would know this because I was a bit late. As I rushed through the gates and to gate 6N, my body’s adrenaline skyrocketed listening to the cheering of “AS-TA-NAA” and the clapping of the booklets. I managed to sit in the best possible area, on the right side of the field where FCA was located. I was so excited and happy to be able to see the players up close! At exactly 36’, Junior Kabananga finally managed to score after a fun back and forth with the Legia Warszawa goalkeeper. Everyone was standing up, cheering loudly and jumping up and down in excitement. They were shouting “JUNIOR” as the announcer yelled “Kabananga, Kabananga, Kabananga…”. I joined in and began shouting and jumping along with the crowd enthusiastically. After this first goal, the cheering and clapping escalated. At exactly the half time mark, ten short minutes later, Ivan Majewski scored another goal for FCA making the score 2:0. This was an amazing way to end the first half! In the summer of 2016, I was at MetLife Stadium to watch Real Madrid play Bayern Munich. Therefore, during half time, I reflected on the differences between the game at MetLife and at Astana Arena. One difference was that at MetLife, there was a big screen that showed certain parts of the game in slow motion. While at Astana Arena, I was blessed to have really good seats, but I imagine that people all the way at the top would have really appreciated the giant screens. During the next half of the game, Armando Sadiku from Warszawa scored a goal at the 79’ minute mark and Astana was not happy! People got up from their seats to throw bottles and started to boo. It was mesmerizing to see just how supportive fans are of their specific team, and just how disappointed they could be. Towards the end of the game, FCA seemed like they were just trying to defend and take a 2:1 win. However, the end of the game was much more exciting than I expected. Due to prior altercations, the game had to be extended 6 minutes past the 90-minute mark. At the end of those 6 minutes, Patrick Twumasi managed to score another goal for FCA!! Everyone stood up and began to dance, cheer and yet again jump up and down showing their support to Astana! It was a beautiful moment, both teams shook hands and then Junior Kabananga managed to leave everyone speechless. He was walking around the field with his colleagues, and when a fan asked to take a picture with him, he hopped the fence just to please the fans!! Everyone stopped to watch him and many people rushed over to take a selfie with him. I tried to rush over, but unfortunately, I did not make it in time. The experience was still beautiful and very enjoyable! I can’t wait for their next game! 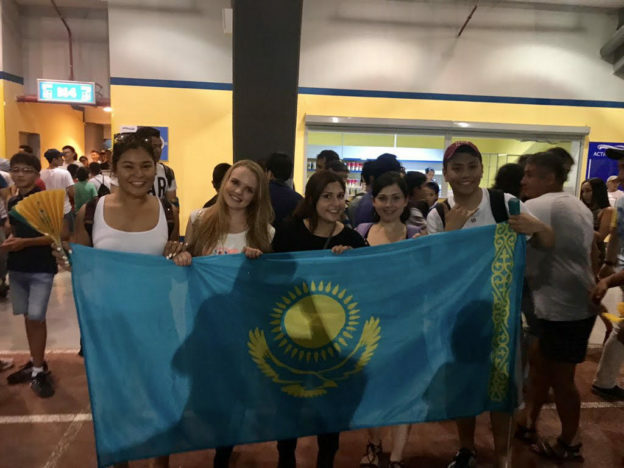 Alga Astana, Alga Kazakhstan!